An abstract and sample chapter are available from PU Press. This book won the 2010 Giovanni Sartori book award from the Qualitative and Multi-Method research section of the American Political Science Association, and was named a 2010 CHOICE Outstanding Academic Title. 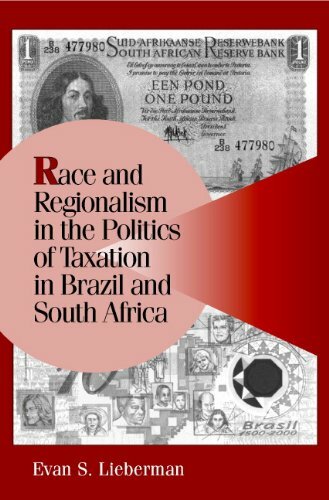 Race and Regionalism in the Politics of Taxation in Brazil and South Africa. (Cambridge University Press, 2003). An abstract is available from Cambridge U Press. This book won the 2004 Mattei Dogan award (awarded by the Society for Comparative Research) for best book published in 2003 in the field of comparative analysis. The book is largely based on my doctoral dissertation, which won the 2002 Gabriel Almond award (awarded by the American Political Science Association) for the best dissertation in comparative politics in 2000 and 2001. “Nuanced Accountability: Voter Responses to Service Delivery in Southern Africa,” (with Daniel de Kadt). British Journal of Political Science, December 2017, 1-31. Data and code are available at Harvard Dataverse (doi:10.7910/DVN/OTEWG2). “Census Enumeration and Group Conflict: A Global Analysis of the Consequences of Counting” (with Prerna Singh). World Politics January 2017, 1-53. Data and code are available at Harvard Dataverse (doi:10.7910/DVN/KJV6OJ). “Can the Biomedical Research Cycle Be a Model for Political Science?” Perspectives on Politics, vol. 14, no. 4, 2016, pp. 1054–1066. “Response to Symposium Reviewers.” Perspectives on Politics, vol. 14, no. 4, 2016, pp. 1080–1082. “Does Stigmatized Social Risk Lead to Denialism? Results from a Survey Experiment on Race, Risk Perception, and Health Policy in the United States” (with Yarrow Dunham and Steven Snell). PloS One (v11, n4, 2016). Data and code are available at Harvard Dataverse (dx.doi.org/10.7910/DVN/MSV9AS). “The Comparative Politics of Service Delivery in the Developing Countries,” In the Oxford Handbook of Politics of Development. (Nicolas Van de Walle and Carol Lancaster, eds. Oxford University Press, 2018). Link here to chapter in handbook or click here for full text (pdf). “Nested Analysis: Towards the Integration of Comparative Historical Analysis with other Social Science Methods,” In Advances in Comparative-Historical Analysis (James Mahoney and Kathleen Thelen, eds. Cambridge , 2015), pp. 240-263. Link to book. “Does Information Lead to More Active Citizenship? Evidence from an Education Intervention in Rural Kenya,” (with Daniel Posner and Lily Tsai). World Development (v60, August 2014), pp. 69-38. Link to journal. “The Ethnicity-Policy Preference Link in sub-Saharan Africa,” (with Gwyneth McClendon). Comparative Political Studies (v46, 2013), 574-602. Click here for full text and here for appendix. “The Institutional Origins of Ethnic Violence,” (with Prerna Singh). Comparative Politics (v45, n1, 2012, 1-24). Click here for full text (pdf). “Conceptualizing and Measuring Ethnic Politics: An Institutional Complement to Demographic, Behavioral, and Cognitive Approaches,” (with Prerna Singh). Studies in Comparative International Development (v47, n2, 2012). Link to journal. Dataset underlying figure 1 can be downloaded in xlsx format. “Descriptive Representation and AIDS Policy in South Africa.” Contemporary Politics Special issue on the politics of AIDS Policy-making (v18, n2, 2012), 156-73. Click here for full text (pdf). “The Perils of Polycentric Governance of Infectious Disease in South Africa.” Social Science & Medicine, (v73, n5, 2011), 676-84. Click here for full text (pdf). “Bridging the Qualitative-Quantitative Divide: Best Practices in the Development of Historically-Oriented Replication Databases,” Annual Review of Political Science, (v13, 2010). Click here for full text (pdf). “The Politics of Demanding Sacrifice: Applying Insights from Fiscal Sociology to the Study of AIDS Policy and State Capacity.” In The New Fiscal Sociology: Taxation in Comparative Perspective, ( I Martin, A Mehrotra, M Prasad, eds. Cambridge University Press, 2009), 105-19. Click here for full text (pdf). “Relative Response: ranking country responses to HIV and AIDS,” (with Chris Desmond, Anita Alban, & Annia-Mia Ekström) (2008/9). Journal of Health and Human Rights, (v10,n2, 2009), 105-119. Click here for full text (pdf). “Ethnic Politics, Risk, and Policy-Making: A Cross-National Statistical Analysis of Government Responses to HIV/AIDS,” Comparative Political Studies, (v40, n12, 2007), 1420-37. Click here for full-text (pdf). “Boundary Politics and HIV/AIDS Policy in Brazil and South Africa,” (with Varun Gauri) Studies in Comparative International Development (Winter v41n3, 2006). Click here for full-text (pdf). “Nested Analysis as a Mixed-Method Strategy for Comparative Research,” American Political Science Review (v 99, n3, 2005), 435-52. Click here for full-text (pdf). “Tobacco Control in Comparative Perspective: Eight Nations in Search of an Explanation,” (with Theodore J. Marmor), in Unfiltered: Tobacco Policy, Politics and Public Health in Eight Industrialized Nations. (Eric Feldman and Ronald Bayer eds., Harvard University Press, 2004), 275-291. Click here for full-text (pdf). “How South African Citizens Evaluate Their Economic Obligations to the State.” Journal of Development Studies (v38, n3, 2002), 47-62. Click here for full-text (pdf). “Taxation Data as Indicators of State-Society Relations: Possibilities and Pitfalls in Cross-National Research.” Studies in Comparative International Development. (v36, n4, 2001), 89-115. Click here for full-text (pdf). “National Political Community and the Politics of Income Taxation in Brazil and South Africa in the 20th Century.” Politics & Society. (v29, n4, 2001), 515-555. Click here for full-text (pdf). “Causal Inference in Historical Institutional Analysis: A Specification of Periodization Strategies.” Comparative Political Studies. (v24, n9, 2001), 1011-1035. Click here for full-text (pdf). (This article won the APSA Politics and History section 2002 Mary Parket Follet award for the best article or book chapter for the year. “Organisational Cloaking in Post-Apartheid Southern Africa: The Southern African Development Community (SADC),” Transformation: Critical Perspectives on Southern Africa (v34, 1997), 86-107. Click here for full-text pdf. “South Africa’s Healthy Democracy: Why Zuma’s Resignation is a Good Sign,” with Daniel de Kadt and Philip Martin, Foreign Affairs (February 20, 2018). “Politicians’ Perspectives on Voice and Accountability: Evidence from a Survey of South African Local Councillors,” with Philip Martin and Nina McMurry,Making All Voices Count Research Report, December 2017 . See also, Konrad-Adenauer-Stiftung Foundation report on presentation of these findings. “Here are 4 reasons that South Africa’s ANC lost ground in this month’s elections,” with Nina McMurry, Philip Martin, and Daniel de Kadt, Washington Post Monkey Cage(August 12, 2016). “Do voters reward the party that delivers basic services? Not in South Africa,” with Daniel De Kadt, Washington Post Monkey Cage(November 10, 2015). “How Nelson Mandela Pulled His Punches and Helped Transform South Africa,” Washington Post Monkey Cage(December 7, 2013). Review of Successful Societies: How Institutions and Culture Affect Health. (Edited by Peter A. Hall and Michèle Lamont. Cambridge: Cambridge University Press), Perspectives on Politics (August 2010), 971-2. Click here for access to review. “Measuring State Institutionalization of Ethnic Categories across Time and Space (with Prerna Singh),”Qualitative and Multi-Method Research, Newsletter of the American Political Science Association Organized Section for Qualitative and Multi-Method Research. Spring 2009, v7, n1: 29-35. “Moving the Doormat to the Main Menu: Case Study Research Methods in the Social Science Toolkit,” remarks from the APSA 2007 Roundtable on John Gerring’s, Case Study Research: Principles and Practices, Qualitative Methods Newsletter of the American Political Science Association Organized Section on Qualitative Methods. Review of African Politics in Comparative Perspective (By Goran Hyden), Journal of Politics (February 2007), 259-60. “Strategies for Field Research,” Qualitative Methods Newsletter of the American Political Science Association Organized Section on Qualitative Methods, 2:1 (Spring 2004). Click here for full-text pdf. “Spotlight on Research,” American Political Science Association Graduate Student Newsletter (v2, n1 Spring 2003). “Nested Analysis in Cross-National Research,” APSA-Comparative Politics Newsletter, (Winter 2003), 14, 1: 17-20. “Paying for ‘Us’ or for ‘Them?’ Attitudes Towards Income Tax Compliance in the ‘New’ South Africa.” IDASA Public Opinion Service Report No. 6, October, 1998.
Business Day (November 2, 1998) published an article summarizing the findings of this research. ANC MP, Andrew Feinstein cited this report in a speech to the National Assembly of the South African Parliament. (May 12, 1998). “Who Will Pay for a Post-Apartheid South Africa? SA Taxation in Comparative and Historical Perspective,” IDASA Intergovernmental Relations Series Working Paper, 1998. “Raising Funds for Provincial Government: Can Taxes Breathe Life into the Provinces?” (With Albert Van Zyl). Business Day (September 23, 1998). “Should the Poor Sacrifice More to the Taxman?” Reconstruct in The Sunday Independent (May 24, 1998).